Better Growth in Brant and Ontario Farmland Trust are hosting an upcoming two-part teach-in series on proposed changes to the Greater Golden Horseshoe Growth Plan. 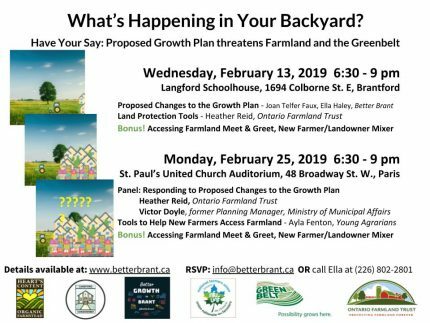 The first event on Wednesday, February 13 at the Langford Schoolhouse (1694 Colborne St. E, Brantford, Ontario) will focus on the proposed changes to the Greater Golden Horseshoe Growth Plan that threaten farmland and would spark sprawl. The event will help participants submit comments to the province, which are due by February 28, 2019. Heather Reid from Ontario Farmland Trust will provide an introduction to tools that help protect farmland and make it more accessible for new farmers. There will also be a mixer for new farmers and landowners. The second event will take place on Monday, February 25 in Paris, Ontario at St Paul’s United Church (48 Broadway St. W). There will be a panel discussion with Victor Doyle, former senior provincial planner, and Heather Reid from Ontario Farmland Trust. The focus will be responding to the recent proposed changes to the Greater Golden Horseshoe Growth Plan that threaten sprawl on farmland. Ayla Fenton from the National Farmers Union and Young Agrarians will provide insight into tools that help make farmland more accessible for new farmers. The evening will end with a new farmer/landowner mixer. Both events will begin at 6:30 p.m. For more information visit the BetterBrant.ca website.